Here is a review about my first time at Cisco Live that took place this week from 28th of January to the 1st of February, at the London ExCeL. I came in London on Monday 28th but didn’t registered for the 1st sessions as they were approximately 1000£ more on what is already an expensive week. Even if the 8 hours CCIE session would have interested me so much, I decided to focus on the other sessions, and the walk-in labs. I started the Cisco week on Tuesday. Cisco invested a lot of money on this week and impressed me a lot, since the DLR (train from the center of London that connect to the London ExCeL) I heard « for passengers going to Cisco Live, please stay in the train until the Prince Regent station » – they payed for that and the DLR was full of guys like me, wearing the 2013 bag offered this week, as you can see below. Second impression when you step out from the DLR and enter the ExCeL, you see the following Big words on the ceiling: « what » « you » « make » « possible ». It gives you an overview of what you’ll see after. Then I walked down the stairs to the check-in desks to obtain my badge and the welcome pack with the famous Cisco Live bag, a T-shirt and some gifts. I walked around the opened stands, drank a coffee and waited for the first event, the keynote with Padmasree WARRIOR, CTO/CSO of Cisco Systems. Here you can see the video of this opening keynote (http://www.ustream.tv/recorded/28919769). She gave us her vision of the future of networking, related to the « Internet of things », the « beginning of a new era » from her own words, SDN (software defined networking) and BYOD (bring your own device), Yeah a lot of marketing terms, but I better understood there sense in the session about the evolutions of routing protocols. The engineers helped me to but some practical cases behind this » marketing words ». Rob SODERBERY (General Manager for the enterprise networking group) also presented the new Cisco Prime, and the brand new 3850 that unify LAN and Wireless, thanks to a new cheap. At 11:00am, I attended a session about the CCIE Data Center training and certification portfolio evolution (BRKCCIE-1001). It was only an overview about how the Learning@cisco guys were working on this certification to fit with the partners and customer’s need. At the beginning of the afternoon, I attended a second session about the Advances in BGP (BRKRST-3371) with Gunter Van De Velde (CCIE#3741), a technical leader from NSSTG team. He talked about some cool new advances that I never heard before, like BGP PIC, or BGP performance enhancements on keepalives, update generation and adaptive update cache size. Then I moved to another session with Shannon McFarland (CCIE#5245) Cisco principal engineer (@eyepv6 on twitter). He talked about IPv6 and the main principles and process we can use to deploy IPv6 on our enterprises (IDBRKRST-2301). It was a really interesting session were I discovered some key points about IPv4 to 6 migration, from the Pre-Deployment phases to the deployment, what we have to take care about during such deployments. Service Provider Core Evolution, with Rabin Masri, a Cisco technical leader. (BRKSPG-2229). Then, I followed the Solution Keynote, were the subjects this day was more Data Center and Security oriented with respectively David YEN and Christopher YOUNG. I’ll add this keynote as soon as I can find it on the Internet. The lunch was the opportunity to see some previous co-workers. The afternoon, I spent all my time in the WoS (World Of Solutions) part of this event were the CISCO partners promoted their products, and offered A LOT of goodies !! I have a lot of USB keys, headphones, T-shirt, mug..etc now. I also walked through the Cisco Book Library, the Social Media center, the Cisco engineers were promoting their products, I was also able to view the new 3850 switch, presented by Rob SODERBERY in the first keynote, and the new Nexus 6004, able to provide 90x 40GB interfaces. Which Routing Protocol? IPv4 and IPv6 Perspective (BRKIPM-3010) from Win Verrydt, he had a Baby so Alvaro Retana replaced him. Anatomy of internet routers (BRKSPG-2772) from Josef Ungerman, a Cisco CSE (CCIE#6167) – This one was particularly hard to follow, but as always interesting. Josef explained everything about how the packets are managed into the internet routers, from the Bus (CrossBar), the memory, the buffers, the CPU..etc. This session has given me headaches !! I also tried the walk-in Labs in the World of Solutions, with the Troubleshooting part of the CCIE. I had a two hours overview of this exam, with approximately 6 questions/problems to resolve. I was an interesting overview, and I really know how much work I have to do now before attending this Lab in October. 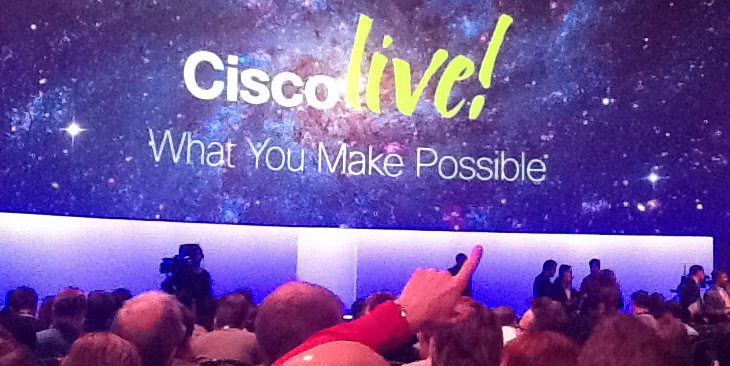 The evening, Cisco organized the Closing ceremony of this Cisco Live event. It was simply amazing !! A lot of games, free beers, other drinks and a lot of food !! Also a reggae concert to begin, and a rock band to continue, playing some songs of Nirvana..etc. Advanced Topics and Directions in Routing Protocols, with Alvaro Retana, a Cisco Distinguished engineer. (BRKIPM-3007). Alvaro explained us the work actually done at the IETF regarding the future Directions of the routing protocol, like the Internet of Things, that standardize IP into sensors and objects of our world, not only computers. They become smart objects, sending informations we can analyses, use..etc. Here comes a lot of new terms like « Smart Objets », « Low power & lossy networks », « Sensor Networks », « M2M »…etc. A lot of engineers are actually working on these thins (The Internet of Things) and it promises an awesome future, and a lot of new applications for the domotic, by example. Data Center Design for small and medium business, with Anver Vanke, a Consulting Systems Engineer (BRKDCT-2218). Anver explained us how we can use the different Cisco product to adapt the Data Center to the « small » and « medium » businesses. To conclude, it was a really good experience with a little bit (who said too much ?) of marketing, but a lot of remarkable Cisco engineers with the possibility to exchange about real business cases if needed and a real opportunity to expend our network. 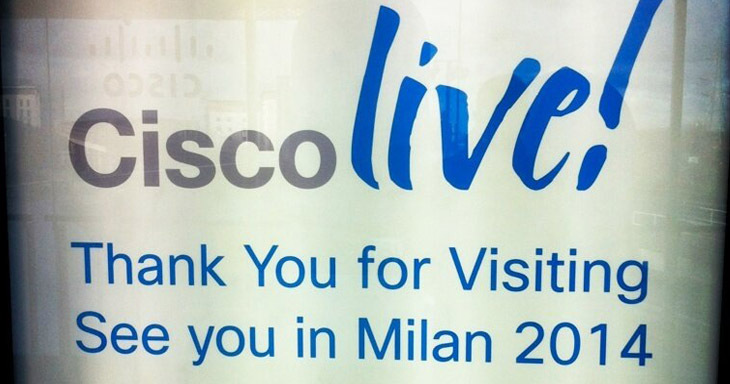 Hope I will have the chance to be part of the next Cisco Live 2014, in Milan (IT).